Stratus and fog look very similar from the satellite’s perspective, both during the day and at night. That is why it is important to include surface information in a product that detects fog and low stratus. The IFR Probability product over stratus-bound Wisconsin at mid-day on November 30 2012 shows a diagonal stripe of higher probabilities from southwestern Wisconsin to north-central Wisconsin. Airports that are reporting IFR or near-IFR conditions are located within this stripe. Over the rest of the state, where IFR probabilities are lower, the large majority of airports are reporting visibilities and ceilings exceeding IFR limitations. The character of the visibile satellite data, and of the brightness temperature difference product, gives very little indication that surface visibilities are reduced primarily from northeast Iowa/southwest Wisconsin to north-central Wisconsin. This entry was posted in Cloud Thickness, Wisconsin on November 30, 2012 by Scott Lindstrom. Large extratropical storms are often accompanied by regions of IFR conditions, but the multiple layers of clouds that are produced by the storms make fog/low stratus detection by traditional means — the brightness temperature difference between 10.7µm and 3.9µm microns (at night) — a difficult prospect. The GOES-R Fog/Low Stratus (FLS) product that fuses satellite data with model (Rapid Refresh) data allows for estimates of IFR probabilities. The imagery above also includes precipitable water estimates from Sounder, GPS and microwave imagery (bottom right), highlighting the tropospheric river of moisture that is impinging on the West Coast. Highest IFR probabilities are occurring in several regions in the animation above. They occur over the Los Angeles basin, for example, where IFR conditions are reported at several airports (San Nicolas and Los Angeles airports, for example). Reduced visibilities are also occurring in the Sierras — Blue Canyon (at 1500 m above sea level) reports IFR conditions — and IFR probabilities are higher along the spine of the mountains. IFR probabilities are also higher along the northern California coast, and stations like Ukiah are reporting occasional IFR conditions. Stations in the central Valley, and along the central coast, are in a region of lower IFR probabilities, and IFR conditions are comparatively rarer there. This entry was posted in California, Multiple Cloud Layers on November 30, 2012 by Scott Lindstrom. Dense fog has developed over the midwest on one of the busiest travel days of the year. The GOES-R IFR Probabilities, top loop, above, show the fog initially over the Mississippi River Valley (this fog had actually formed the night before and persisted through the day — link) and then spreading eastward towards Chicago’s O’Hare Airport. 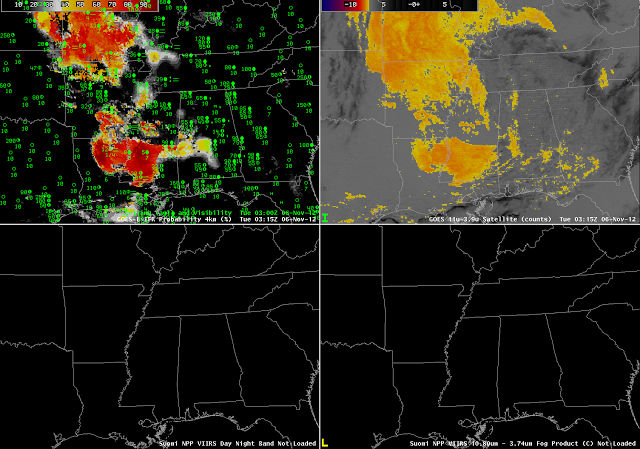 The animation of GOES-R IFR probabilities and surface observations depicts the widespread nature of the fog. Compare the fields above to the fields of the brightness temperature difference, the Heritage Fog Detection product, just above. Several notable differences are obvious. Note, for example, that at the start of the loop, much of Michigan is covered by a strong brightness temperature difference signal, but IFR conditions are not common. The GOES-R IFR Probabilities correctly shows low probabilities of reduced visibilities under the elevated stratus deck over Michigan. There are several upper cloud features that propagate across Illinois during the course of the night. These features prevent the Heritage Cloud Product from detecting low clouds. For example — the region over southern Wisconsin at 0515 UTC. The IFR probabilities decrease in this region (and acquire the characteristically smooth appearance that arises when model predictors predominate in the computation of probabilities), and rebound once the higher clouds move off to the south and east. The 0515 UTC images for both products are below. The Wednesday before Thanksgiving is a very busy travel day through O’Hare, the timing of the fog dissipation is therefore of utmost importance. The depth of the fog/low stratus at that time just before twilight conditions (when the product is not computed) can be related to dissipation time, as shown in this graph. The last cloud thickness estimate just before sunrise, below, was around 1000 feet over O’Hare, suggesting that the Fog will burn off about 3 hours after sunrise (13:00Z). The images below show the fog clearing across the area. Note how the areas where the last cloud thickness estimate before sunrise was thicker (Central Illinois and SW Wisconsin where thicknesses were close to 1200 ft) takes longer to clear than areas where the clouds were thinner (E Wisconsin and NE Illinois around O’Hare where thicknesses were around 1000 ft). GOES-R IFR probabilities (top left), GOES-R cloud thickness (top right), heritage 3.9-11 micron BTD product (bottom left) and visible satellite image (bottom right) for Nov 21, 2012 at 16:15 UTC. Surface observations of ceiling and visibility are in blue. 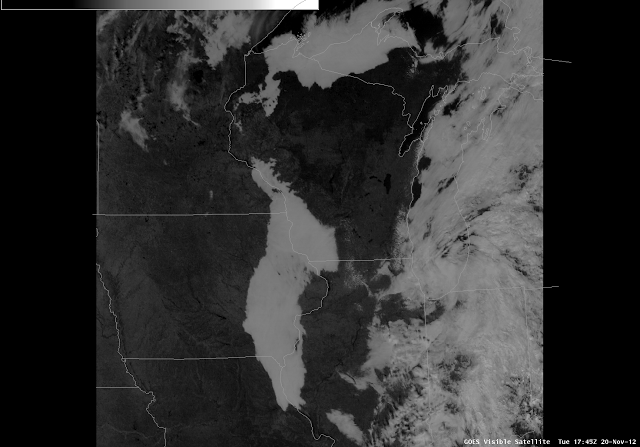 In the above image at 16:15 UTC (about 3hrs after sunrise) the fog has cleared near O’Hare, in SE Wisconsin and other areas where pre-sunrise cloud thicknesses were ~1000 ft. In the image below at 18:15 UTC (about 5 hours after sunrise) the fog has cleared everywhere except central Illinois where the largest pre-sunrise thicknesses were estimated. GOES-R IFR probabilities (top left), GOES-R cloud thickness (top right), heritage 3.9-11 micron BTD product (bottom left) and visible satellite image (bottom right) for Nov 21, 2012 at 18:15 UTC. Surface observations of ceiling and visibility are in blue. As seen below, by 19:32 UTC (about 6.5 hrs after sunrise) the last small pockets of fog finish burning off. It was noted by a NWS forecaster in Sullivan, WI that a strong low-level inversion was present that took longer to erode than usual. This likely resulted in some of these lingering areas of fog to persist a little longer than was estimated using the last pre-sunrise GOES-R cloud thickness relationship. The complete animation is available here. GOES-R IFR probabilities (top left), GOES-R cloud thickness (top right), heritage 3.9-11 micron BTD product (bottom left) and visible satellite image (bottom right) for Nov 21, 2012 at 19:32 UTC. Surface observations of ceiling and visibility are in blue. Fog was considerably less dense at the Lakefront in Chicago. 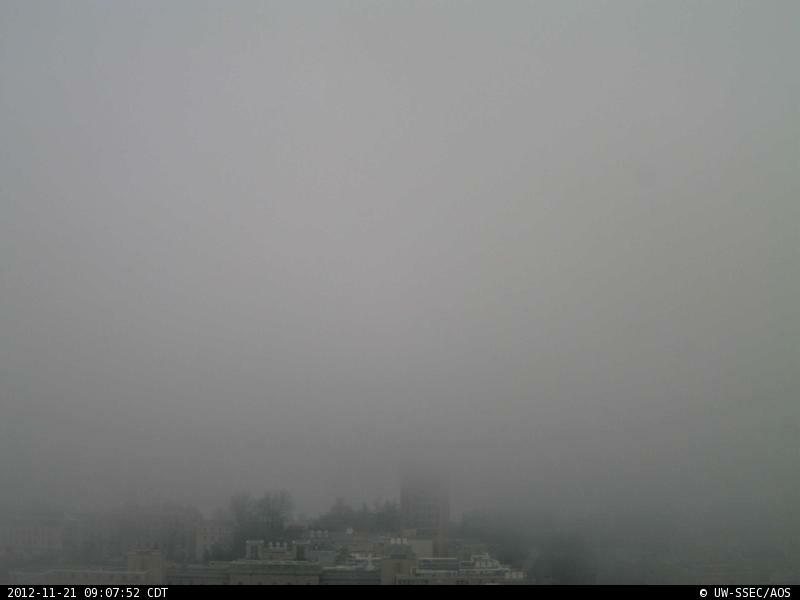 Various web-cam captures, below, demonstrate the variable denseness of the fog in Chicago, and also in Madison, WI. 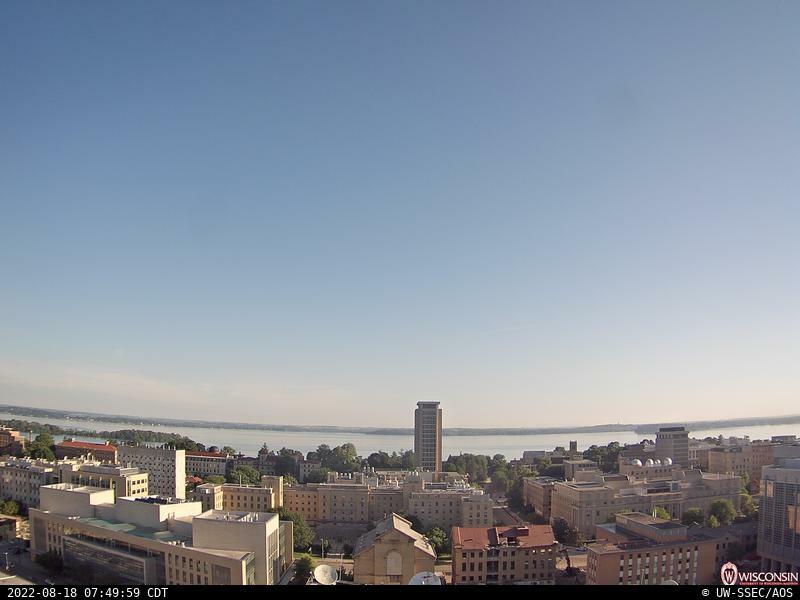 North-Facing Webcam, Madison WI, time as indicated. Source. 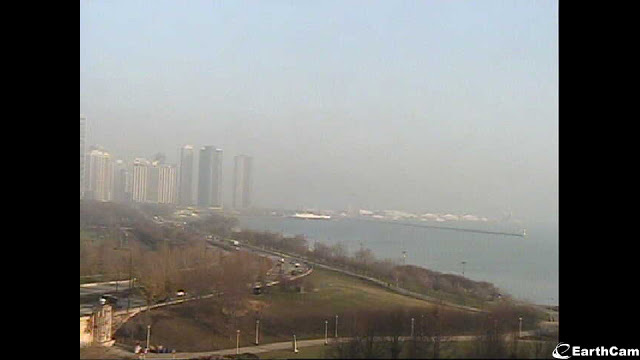 North-Facing Webcam from Field Museum in Chicago, ca. 1445 UTC 21 November. Source. 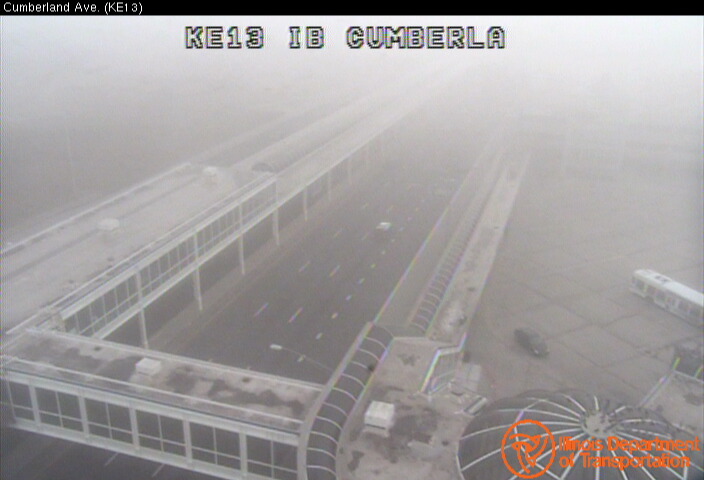 Kennedy Expressway at Cumberland Ave, ca. 1445 UTC 21 November 2012. Source. This entry was posted in Cloud Thickness, Dissipation Time, Midwest on November 21, 2012 by Scott Lindstrom. 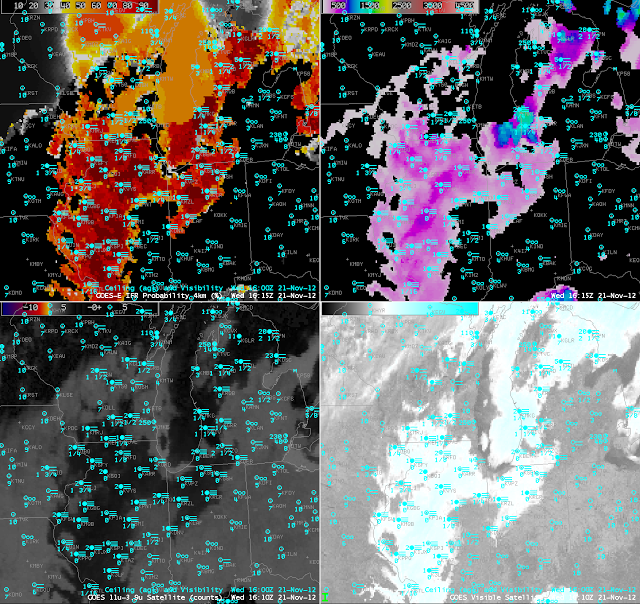 GOES-R IFR Probabilities computed from GOES-East (upper left), GOES-East Traditional Brightness temperature difference, 10.7 µm – 3.9 µm (upper right), GOES-R Cloud Thickness (lower left), GOES-East Visible (0.63 µm ) imagery (lower right), from approximately 0230 UTC 20 Nov 2012. Dense fog developed over portions of the upper Mississippi Valley early in the morning on 20 November 2012. This event forced delayed openings for many eastern Iowa schools. How well did the GOES-R Fused Data products do for this event? 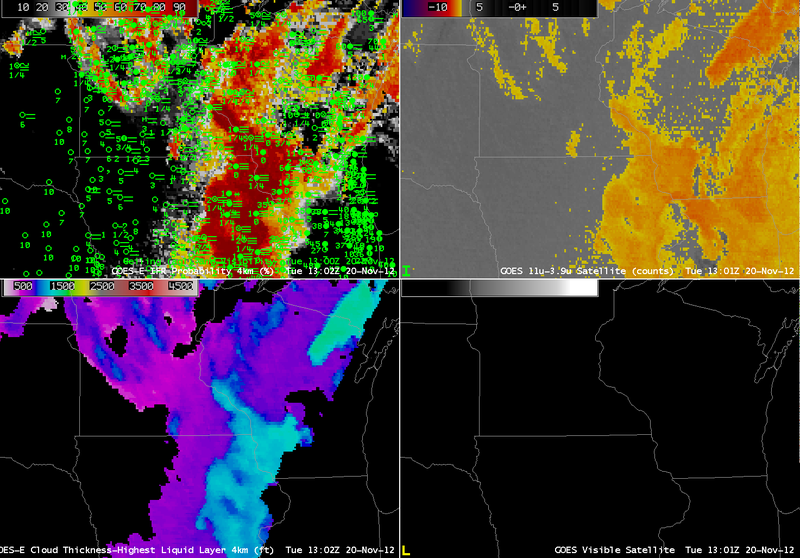 The animation above shows the quick development of high IFR probabilities over Iowa; development over northwest Wisconsin, where IFR conditions were observed, was delayed. Why? The imagery above, from 0230 UTC, shows IFR probabilities increasing over eastern Iowa where near IFR conditions are already developing. At 0330 UTC, below, ceilings and visibilities continue to lower over eastern Iowa where IFR Probabilities increase. Note that the traditional brightness temperature difference field shows a strong signal over Wisconsin and Illinois — but IFR conditions there are not widespread, and IFR probabilities are except over southwest Wisconsin. The 0330 imagery also hints at higher clouds moving in from the west over southwest Minnesota and western Iowa/eastern Nebraska, where the darker regions in the brightness temperature difference product exists. 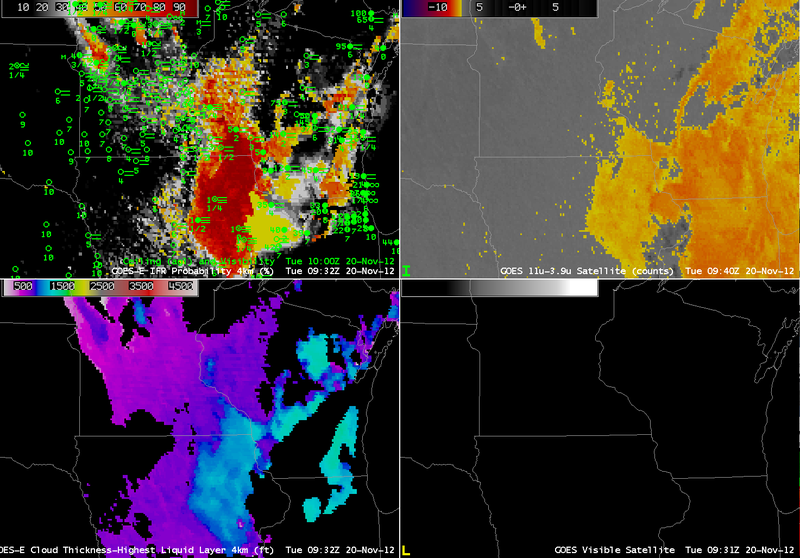 GOES-R IFR Probabilities computed from GOES-East (upper left), GOES-East Traditional Brightness temperature difference, 10.7 µm – 3.9 µm (upper right), GOES-R Cloud Thickness (lower left), GOES-East Visible (0.63 µm ) imagery (lower right), from approximately 0330 UTC 20 Nov 2012. 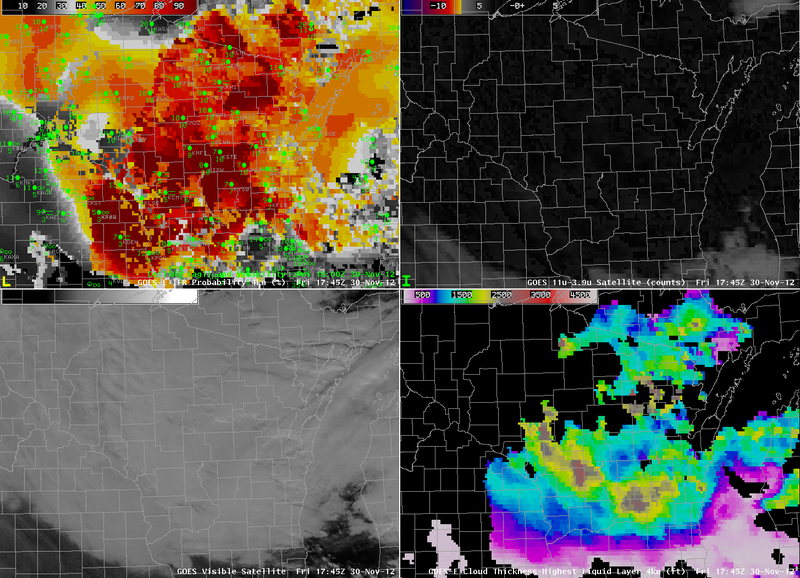 GOES-R IFR Probabilities computed from GOES-East (upper left), GOES-East Traditional Brightness temperature difference, 10.7 µm – 3.9 µm (upper right), GOES-R Cloud Thickness (lower left), GOES-East Visible (0.63 µm ) imagery (lower right), from approximately 0530 UTC 20 Nov 2012. 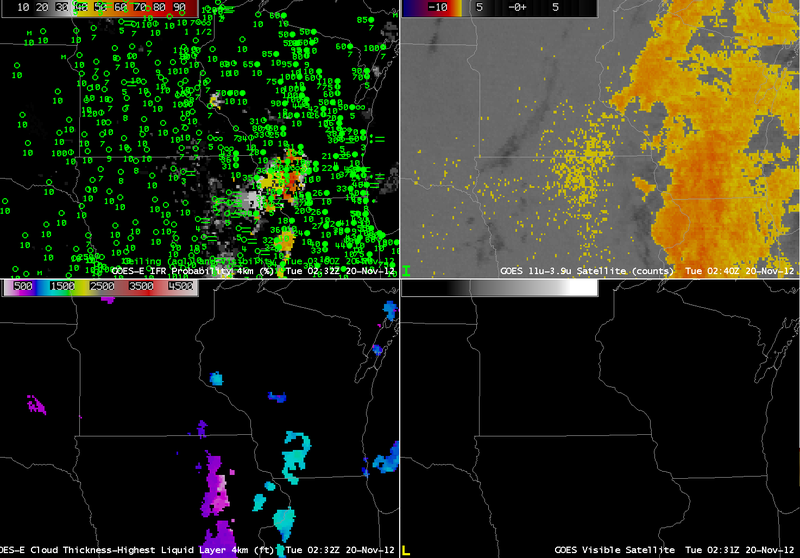 Two hours later, at 0530 UTC, IFR conditions are widespread over eastern Iowa where the traditional brightness temperature difference product has a signal, and where GOES-East-based GOES-R IFR Probabilities are very high. The Traditional brightness temperature difference signal from GOES-East continues to have a strong signal over central Wisconsin southward into Illinois where, except for southwest Wisconsin, IFR conditions are not common. Note the development of IFR conditions in northwest Wisconsin, in a region where IFR probabilities are low. In this region, satellite detection of low clouds is complicated by higher clouds (indicated by the dark region in the brightness temperature difference product). In addition, low-level relative humidity fields at this time in the Rapid Refresh model are lower than they are over Iowa (see the animation of fields used to compute IFR probabilities at the bottom of this post). GOES-R IFR Probabilities computed from GOES-East (upper left), GOES-East Traditional Brightness temperature difference, 10.7 µm – 3.9 µm (upper right), GOES-R Cloud Thickness (lower left), GOES-East Visible (0.63 µm ) imagery (lower right), from approximately 0730 UTC 20 Nov 2012. At 0730 UTC, above, mid-level clouds over eastern Iowa are having an effect on IFR probabilities there. Because satellite predictors cannot give a strong indication of fog/low stratus when mid-level (or higher) clouds are present, IFR probabilities will decrease. 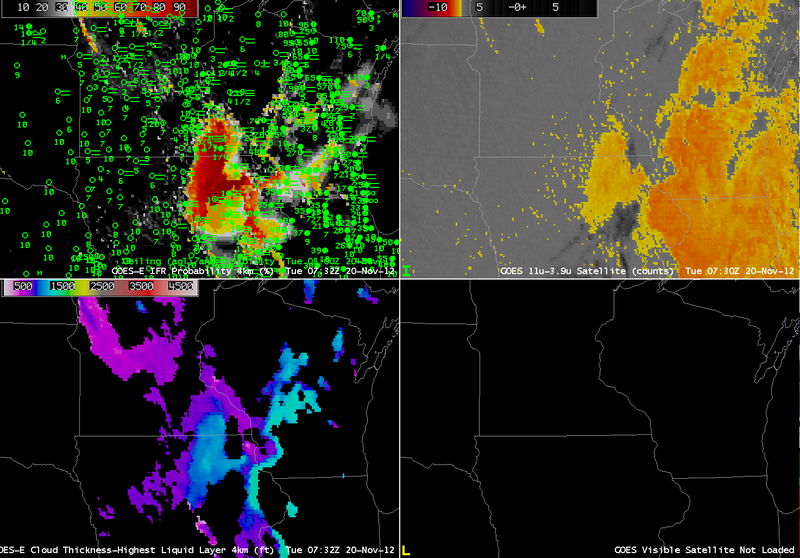 This is happening over portions of eastern Iowa where IFR conditions persist. Probabilities fall, and the field acquires a much smoother look; in addition, Cloud thickness is not computed. These occurrences all are a consequence of the presence of higher clouds, as depicted by the darker grey enhancement in the traditional brightness temperature difference field. Note that IFR probabilities continue to be fairly low over northwest Wisconsin where IFR or near-IFR conditions are present. 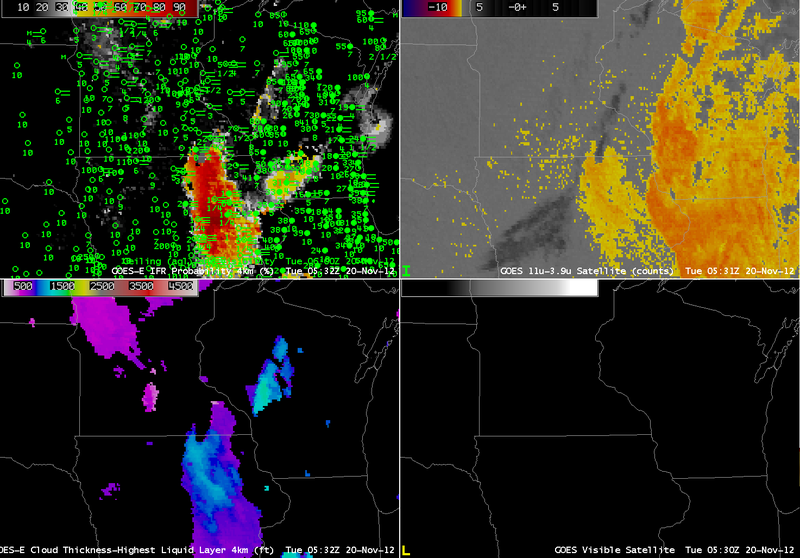 GOES-R IFR Probabilities computed from GOES-East (upper left), GOES-East Traditional Brightness temperature difference, 10.7 µm – 3.9 µm (upper right), GOES-R Cloud Thickness (lower left), GOES-East Visible (0.63 µm ) imagery (lower right), from approximately 0930 UTC 20 Nov 2012. By 0930 UTC, IFR probabilities finally do increase over northwest Wisconsin where IFR or near-IFR conditions are present (similarly, they increase over eastern Wisconsin near Lake Michigan). Both the satellite signal and the Rapid Refresh signal have started to suggest low clouds near the surface, as observed. An animation of fields important to the computation of IFR probabilities is below. Note how the near-surface relative humidity saturates first over eastern Iowa; that saturation is slow to spread northward into northwest Wisconsin. Heritage Fog Algorithm (10.7 µm – 3.9 µm ) from GOES-East (upper left, white = fog/low stratus), GOES-R Cloud Type (upper right), GOES-East 10.7 µm imagery (lower left), Peak Rapid Refresh Model Relative Humidity below 500 m (lower right), hourly from 0432 UTC through 0932 UTC, 20 November 2012. Data from this site. The last pre-twilight Cloud Thickness product can be used to guess the dissipation of radiation fog. Those data are shown below. 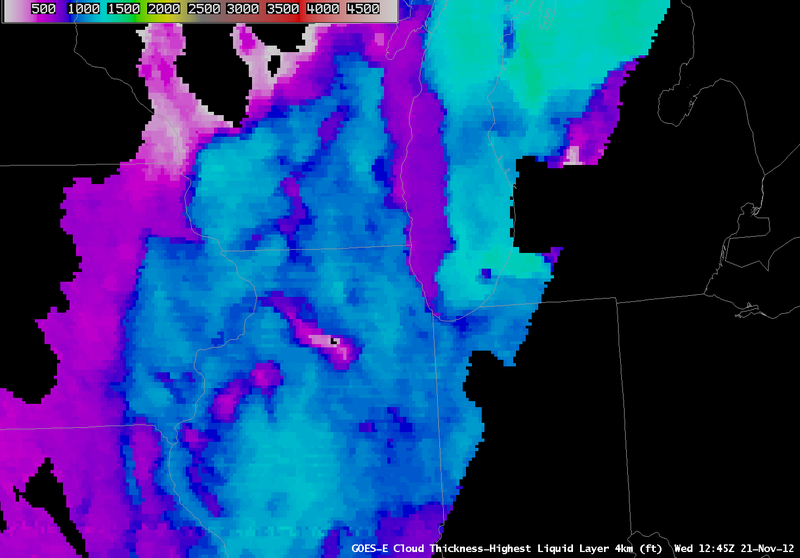 Cloud thickness over eastern Iowa and southwest Wisconsin peaks around 1200 feet. This graph suggests, then, a dissipation time about 5 hours after sunrise. 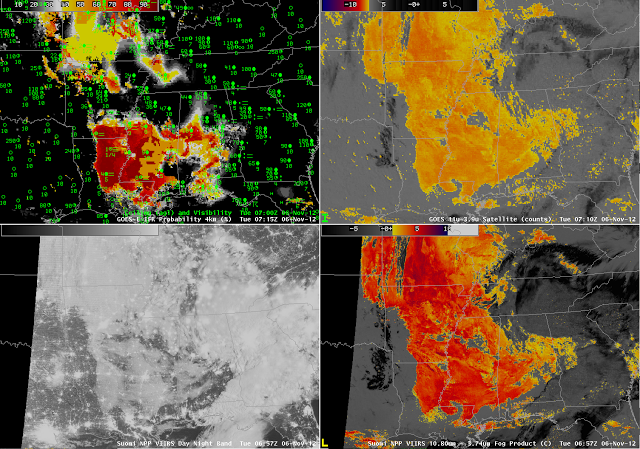 GOES-R IFR Probabilities computed from GOES-East (upper left), GOES-East Traditional Brightness temperature difference, 10.7 µm – 3.9 µm (upper right), GOES-R Cloud Thickness (lower left), GOES-East Visible (0.63 µm ) imagery (lower right), from approximately 1300 UTC 20 Nov 2012. 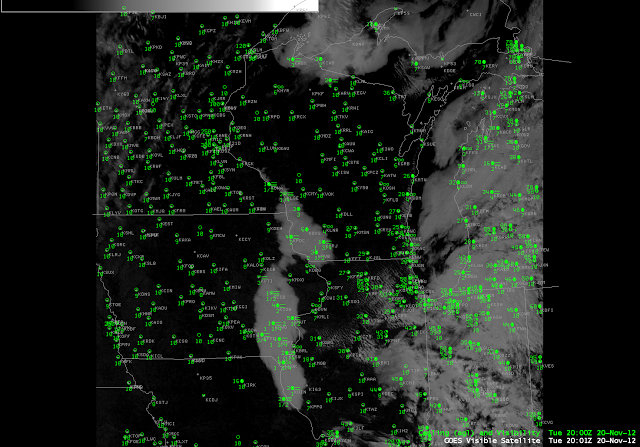 Note how well the low clouds over eastern Iowa at 1745 UTC align with the cloud thickness field at 1300 UTC! This entry was posted in Cloud Thickness, Dissipation Time, Error Explanations, Midwest on November 20, 2012 by Scott Lindstrom. Tuesday morning’s low cloud/fog event over southern Florida is an excellent example of how the fused product better distinguishes between fog (that reduces visibility at the surface) and low stratus (that does not reduce visibility at the surface). The traditional brightness temperature difference products from both GOES (Upper Right) and VIIRS (Lower Right) show a strong signal over both Florida coasts — Atlantic and Gulf — but the IFR probabilities are highest along the Atlantic Coast — where IFR and near-IFR ceilings/visibilities are observed. 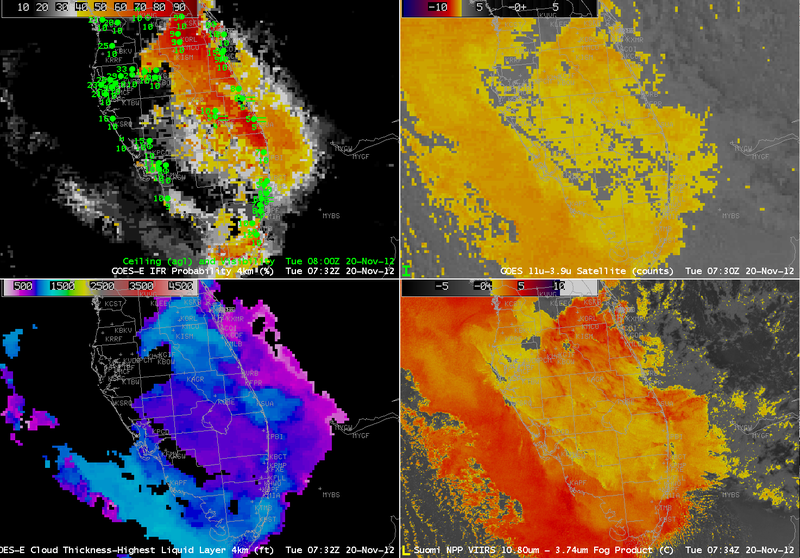 Over and off the west coast of Florida, despite the very strong satellite signal, IFR probabilities are low because saturation is not occurring in the lowest part of the Rapid Refresh Model — and IFR conditions are not observed. This entry was posted in Cloud Thickness, Southeast, Suomi/NPP on November 20, 2012 by Scott Lindstrom. Fog and low clouds that developed over central Florida (again) on Monday morning, 19 November, highlight some strengths and shortcomings of the different fog detection techniques. The GOES-R IFR Probability (upper right) shows highest probabilities in the region where the traditional brightness temperature difference product has a distinct signal. But there is also a region of IFR probabilities (albeit low) east of Tampa Bay where the traditional brightness temperature difference product has no distinct signal. This is likely a region of developing fog/low stratus. Note that the higher-resolution Brightness Temperature Difference product from VIIRS on Suomi/NPP has a signal in that region, and the MODIS-based IFR Probability (lower right) field is also consistent with a developing fog/low stratus field. The low IFR Probabilities in the GOES-based signal should alert to the possibility of developing fog. Note that both the GOES-Based and MODIS-based IFR probabilities show a narrower strip of fog/low stratus south of Jacksonville than is represented in the GOES and Suomi/NPP Brightness Temperature Difference fields. In this region, the Rapid Refresh Model data are refining the satellite predictors to represent more accurately the distribution of fog/low stratus in the Rapid Refresh model output. The IFR Probabilities at 1000 UTC (below) shows that IFR conditions did indeed develop in that region of interior Florida to the east of Tampa. The Traditional Brightness Temperature Difference field shows a signal that parallels the west-facing Gulf coasts of Florida. This signal arises from a co-registration error between the shortwave IR and longwave IR sensors on GOES (See this post for more examples). This co-registration error is diurnally varying and typically peaks between midnight and sunrise. This entry was posted in Error Explanations, MODIS, Southeast, Suomi/NPP on November 19, 2012 by Scott Lindstrom. GOES-R IFR Probabilities computed using GOES-West and Rapid Refresh Data (Upper Left), GOES-R Cloud Thickness (Upper Right), GOES-West Brightness Temperature Difference (10.7 µm – 3.9 µm) (Lower Left), Topography over Southwest Alaska (Lower Right). Portions of Southwestern Alaska in the Kuskokwim and Yukon River valleys experienced IFR or near-IFR conditions overnight between 11 and 12 November. How did the half-hourly animations of GOES-R IFR probability and cloud thickness (as well as the traditional brightness temperature difference product) depict those reduced visibilities? The beginning of this animation shows the effect of twilight conditions on the Cloud Thickness Product (upper right); this product shows the thickness of the highest boundary layer cloud during non-twilight conditions. If twilight conditions are occurring, or if higher clouds are moving into a region (as is occurring over Nushagak and Bristol Bays near Dillingham at the end of the animation), then the product is not generated. The area of IFR conditions over southwest Alaska from St. Marys to Sparrevohn, McGrath and Bethel southwestward to Dillingham is depicted will in the IFR Probability fields. Light winds in this region are allowing the low clouds to develop. Relatively high values of IFR Probabilities, and the pixelated look to the field mean that both satellite and model predictors are being used over most of this region in computing the IFR probabilities. An exception occurs over Cape Newenham near the end of the animation when lower IFR probabilities and a smoother field suggest that satellite-based predictors are not being used (because of the presence of multiple cloud layers). This is also true of regions in the far southwestern part of the shown domain at the end of the animation. This entry was posted in Alaska, Cloud Thickness, Terrain on November 12, 2012 by Scott Lindstrom. IFR Conditions developed over the deep south overnight on the 5th/6th of November. How did the GOES-R IFR Probabilities capture this event, and how do the fields compare to the traditional brightness temperature difference fields? At 0315 UTC, near-IFR conditions have developed over central Mississippi and over southwest Missouri, the two regions where IFR probabilities are diagnosed to be highest. Rapid Refresh Model data are appropriately de-emphasizing the satellite signal in regions where IFR conditions are not reported (northeast Arkansas, for example). Four hours later (below), at 0715 UTC, the area of IFR conditions over Mississippi has expanded somewhat, and the IFR Probability field continues to suggest — strongly — that IFR conditions are present. Both the traditional brightness temperature difference field and the IFR probability field suggest a sharp western edge to the fog/low stratus over north-central Louisiana, and that sharp edge is confirmed in the Day/Night band from VIIRS on Suomi/NPP. 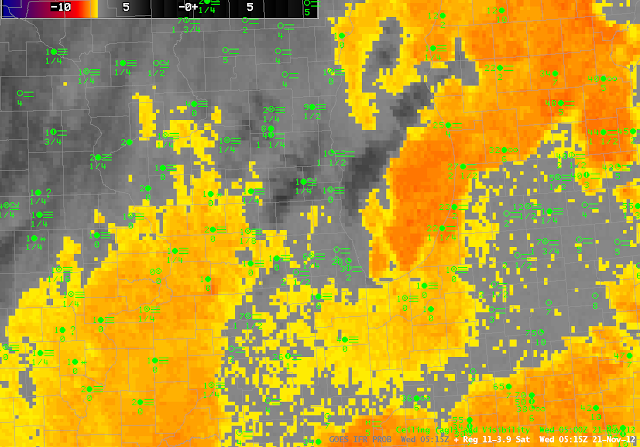 The Brightness Temperature Difference fields from both GOES and from VIIRS suggest one large field of fog, but the IFR probability field has two separate fields: one over Mississippi/extreme southern Arkansas and Louisiana, and one over southern Missouri. This entry was posted in Day/Night Band, Deep South, Suomi/NPP on November 6, 2012 by Scott Lindstrom. Fog developed over central Florida overnight underneath a thin cirrus (as indicated by both the water vapor and brightness temperature difference imagery). Cirrus clouds prevent the traditional brightness temperature difference field from identifying low fog/stratus because the high ice clouds are detected rather than the developing low-level water clouds. This is a case, then, when a fused product gives needed surface information to help diagnose the development of fog and low stratus. The brightness temperature difference product, the traditional method to detect fog and low stratus, is giving no information where dense fog is forming. On this date, the development and expansion of the higher IFR probabilities over central Florida neatly matches the development of IFR conditions at the observing stations. Probabilities are not high because the satellite predictors are not contributing to the algorithm. It is important when interpreting the IFR probabilities to be aware of the presence of high clouds that will influence IFR probability values. Where the cirrus clouds are not present, notably over northeast Florida, IFR probabilities are much higher because satellite predictors there are contributing to the final probability. This case also shows that the Cloud Thickness is only computed where the highest clouds detected is a water-based cloud. Underneath the cirrus shield, except for a few regions where there are apparently holes, cloud thickness is not computed. The toggle above flips between the Day-Night band from VIIRS on Suomi/NPP and the GOES-R IFR probability at the same time. The thin cirrus shield is readily apparent, and the regions of fog are also visible in the Day/Night band over north-central Florida and over coastal South Carolina. A MODIS-based IFR Probability (shown below) was also created at 0715 UTC, and it shows a pattern similar to that above. The pixelated part of the image corresponds to where satellite data are being used. The region with lower values, and a flatter field, was created using only model predictors and, as noted above, is characterized by lower probabilities. The highest probabilities are in regions where both satellite and model predictors are very confident that IFR conditions are present. This entry was posted in Cloud Thickness, Day/Night Band, MODIS, Multiple Cloud Layers, Southeast, Suomi/NPP on November 5, 2012 by Scott Lindstrom.